Carnations are such happy flowers and this color combination is bright and cheery. These inexpensive little bouquets get a bad rap. They’re pretty. They’re hardy. They last a long time. And they come in just about every color under the sun. Best of all, they’re super-affordable. Buy a bouquet or two of these cute little blooms in different colors. Take one (or more) of the smaller vases you no longer need. Make a small, cheerful arrangement in the vase. Or make two. And drop them off to someone who might need their day to be brightened. Maybe an elderly person. A shut-in. Someone who’s been sick. Someone who just achieved something big. Random acts of kindness. The best kind. Especially when they’re flowers.. I love carnations too, Carol. And that’s a fab idea – such a thoughtful thing to do too. Thanks, Corinne! Have a beautiful day in Mumbai! such a good thought to always look for places to brighten other people’s lives. Yes, such a simple thing, really! Love it, Carol! I have so many of those vases that I keep. Now I have your idea on ways to put them to better use! That’s great, Cathy! Let me know how it goes! It really is the simple things, isn’t it? I love bouquets of all kinds, from roses to wildflowers. In fact, I think I’m going to go in my yard today and make one. Thank you for the inspiration. This is my first visit to your blog and I look forward to more. I am all about creating and recreating myself. I’m so glad you dropped in and hope you’ll follow along. I look forward to seeing yours, as well! Lovely idea, Carol! And I think the spicy smell of carnations is wonderful. It seems that folks are desperate for color after the winter. This would be sure to brighten someone’s day. Flowers are really a wonderful gift and Carnations looks really very beautiful. So happy someone will benefit! I love this! So simple! So elegant! So cheerful! Perfect! This is a fabulous idea. I have so many of those vases. I am going to do this tomorrow, adding some candy. Have a positive and poweful day! Great idea. 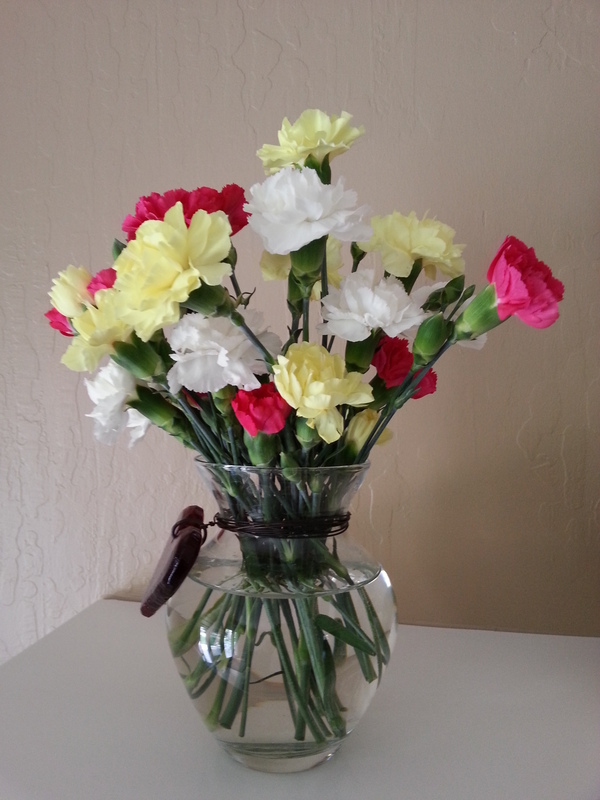 I have a plentiful stash of vases that I buy at Goodwill or yard sales, so I can easily make bouquets to give away. Thanks for reminding me to do it.